Sometimes you just gotta see it to believe it. The secular left can come up with the most outrageous, imbecilic and just plain ghastly things around. One could put together a series of books just highlighting the things found on their banners, signs and posters. 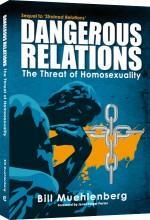 They can be utterly mindboggling, reflecting a complete dearth of mental and moral health. 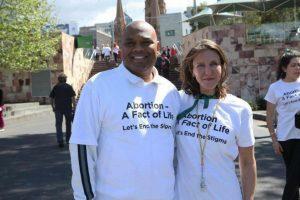 Simply confining our selection to the sorts of things we see by the pro-abortionists could fill a few volumes. And that is what I wish to attempt here. This is the first time I am trying to write an article which is mainly composed of pictures, with much less text than normal. I usually try to have at least one pic to go along with each article of mine, but as we know, a picture is worth a thousand words. My apologies if you happen to be visually impaired, but for the rest of you, seeing these pictures may do a whole lot more good than just writing about them. So I will here offer a dozen pictures, mostly from various public abortion marches, along with some commentary about each. There I discussed a number of these pictures and posters, but it seems that actually seeing them will help in at least two ways: 1) it will prove I am not making these things up; and 2) you can see for yourself just how depraved, deranged and degenerate some of these banners and signs really are. 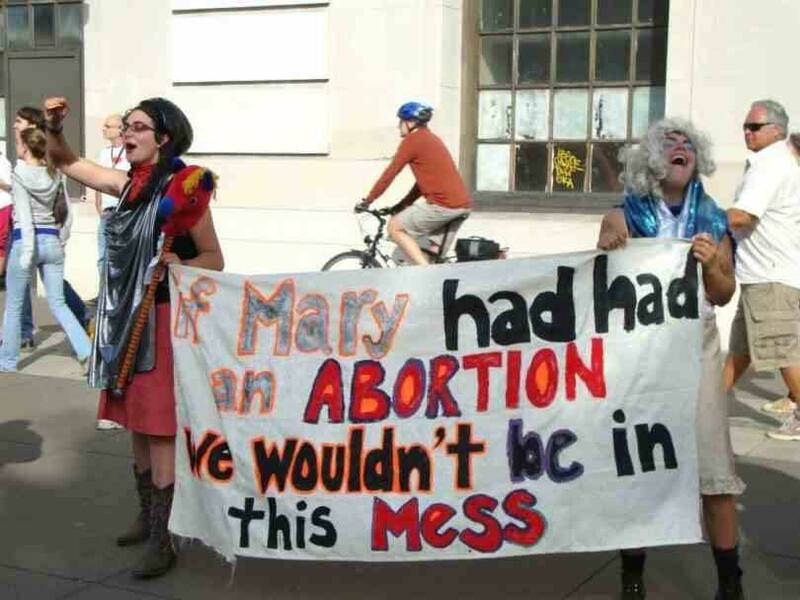 Back in San Francisco in 2011 at the Walk for Life West Coast some pro-aborts held up a large banner with these words: “If Mary had had an abortion we wouldn’t be in this mess.” Once again, we see the hatred of God fully coupled with the hatred of life. 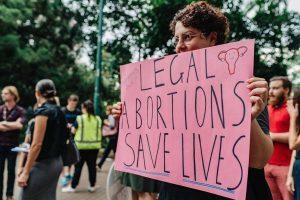 At another prolife rally I attended, one pro-death protestor held up a sign with the words, “Legal abortion saves lives”. Wow. Talk about Orwellian doublespeak. Talk about believing a lie. So legal baby killing saves lives? Try telling that to all the dead babies. 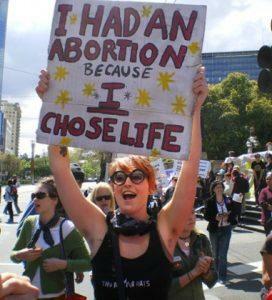 Another sign proudly held up said this: “I had an abortion because I chose life.” Yes, she actually said that. This is now a case of where white has become black, and the mind has turned to mush. To say such things with a straight face demonstrates both mental and moral degeneration and death. 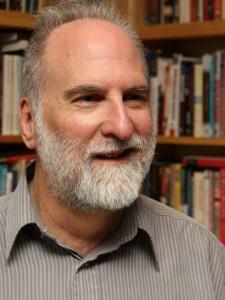 The truth is, most laws deal with morality, and most moral issues have legislation involved. Since abortion is about taking the life of another (murder), all civilised societies have laws about such matters. 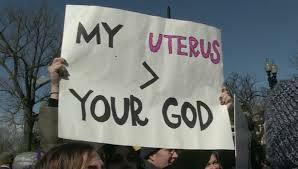 Actually, the God who made you and your uterus is of course far greater. But even leaving God out of the equation, the baby growing inside of you is not less than you are. Both mother and baby have an equal right to life. Um no, it’s the baby’s body. If it were your body, you’d be the one who dies. 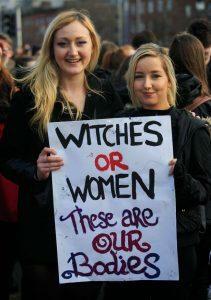 And we even saw on the news reports pro-death marchers in Ireland carrying their toddlers with them! 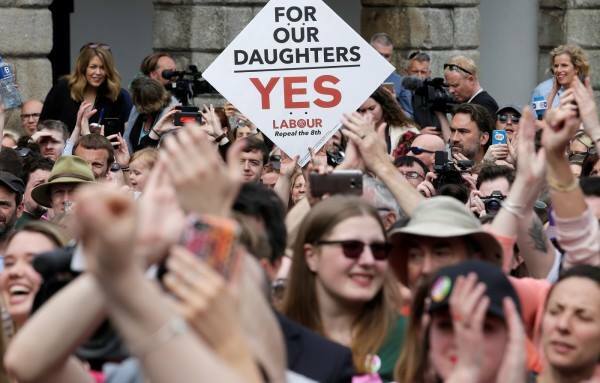 One Irish repeal advocate had this sign held high: “For our daughters: YES. 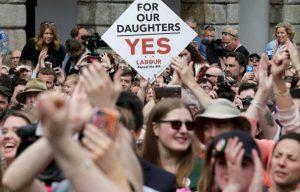 Repeal the 8th.” Um, which daughters? The ones who are killed, or the ones who escape the death sentence? There would be plenty more such banners and signs to run with, but hopefully by now you get my drift. There is a lot of evil out there, and a lot of minds and hearts that have become darkened beyond recognition. This is what we are up against. This is part of the cosmic battle that we are engaged in. This is what the hardening of the heart looks like. Everyone, especially people with positions of authority should teach and make very clear the reasons why this practice is evil, to fully explain why it is considered murder and what the consequences of this grave sin are. Thank you for the photos, Bill, as they “say it all.” I also want to thank Paul Kenins for his thoughtful comment and his wisdom in quoting Saint Paisios. Truly any nation with laws that support this evil is inviting the wrath of God to fall on it. As the Bible says, “In the last days men shall be lovers of themselves rather than the lovers of God,” and we see this very evident in the pro-abortion movement. The main evil of the abortion movement is that there is no concept of an innocent being. I have said it before, it does not matter whether a living being is an abandoned dog, a stray cat, an unplanned-for baby, a handicapped person, or an elderly person; any being seen as a burden or inconvenience to others can become the object of disposal by legalized death. This kind of thinking fueled Nazi Germany, and it is sad to think the evils the free world tried to combat in World War II became legal and acceptable in the U.S. and the rest of the free world roughly 30 years later. The acceptance of abortion also has led the medical profession to curtail efforts to save premature infants by setting a cut-off date of 22 weeks and five days gestation. The estimated age may be a mistake, or some unborn infants may be stronger or more developed than others, and yet there are cases where these variables were not considered. There also is less attention paid to saving the life of the mother, so that women suffering miscarriages are at risk of developing sepsis (blood poisoning) and gangrene during a miscarriage. 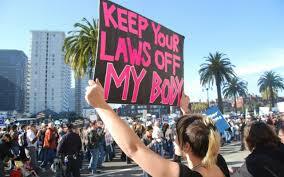 Instead of delivering the fetus and helping it to survive, the woman is left to linger until the fetus dies in utero. By this time the woman very likely has developed some form of the deadly infections. 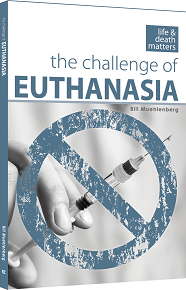 Tragically, this “Culture of Death” put everyone at risk in one way or another. I apologize for writing the last part of my comment in haste because I made an unclear statement. In most cases of miscarriage, the fetus already has died. There are other instances in which the fetus still is alive and in which there is confusion as to whether the event is a miscarriage or premature labor leading to premature birth. I hope no one was confused or upset by what I wrote. I also hope people will become aware of policies the medical profession has in these cases. When I think of legalised abortion and the egregious euphemisms which constitute its decayed ethical foundations, the ancient Greek notion of miasma, an accursed uncleanness which haunts and perpetuates the destruction a community with innocent blood on its hands comes to mind: Have today’s nations any right to the mercy of God when, like ancient Carthage, their economic prosperity is purchased by the sacrifice of their own children? 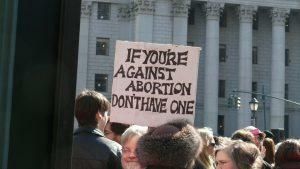 Abortion is never always about a woman’s right to choose. 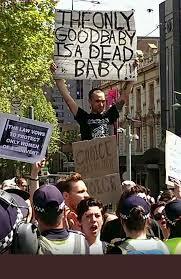 It is a man holding the poster which says, “The only good baby is a dead baby.”… Margaret Sanger, in her 1938 autobiography, recounts how there was a time around the end of World War I, when male German physicians saw abortion as the tool for men to control their women’s fertility [See: https://archive.org/stream/margaretsangerau1938sang#page/286/mode/2up for the instance in question.]! As Jesus said, “Forgive them as they do not know what they are doing”. Hopefully the Gospel of Christ will come to each one of them and they will turn and repent because that is their only hope. Yes Scott we must pray for them and share truth with them. But I suspect most actually DO know what they are doing – that is the really scary part. I have 11 grandchildren and I love every one of them. They are either cute, cuddly, cheeky, full of beans and never a dull moment with them. Everyone contributes something to the family and has unique appeal. I love having them in my arms and telling them stories or lame jokes and letting them know how proud grandad is to have them as his grandchild. I do not know how anyone can say “NO, I don’t want you” and have them ripped apart and thrown into the bin. Abortion must be the best example of a society that has gone totally and completely mad. Even animals do not kill their babies in the womb. 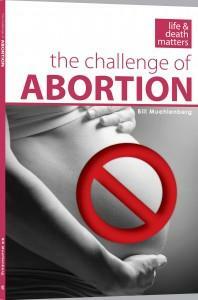 There are even some cases of abortion where the baby survives the abortion. These children are usually left to die without food, water or milk. I think that they are left in a hospital room with dirty linen and bedpans. These children should have a right to medical treatment and to be fed. Under the Universal Declaration of Human Rights they should have a right to life, medical treatment and nourishment. The baby could be offered to the mother and father. If they do not want the child it could be put up for adoption. 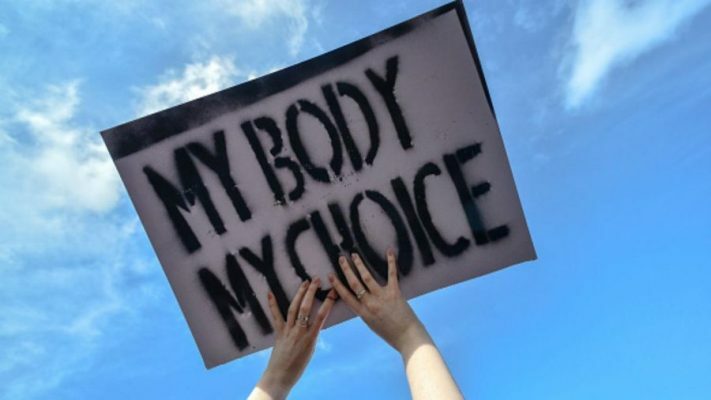 Once abortion is legalised there is not much difference between abortion and infanticide. I have heard that abortion survivors have also been suffocated. If a child survives an abortion they do not tell the mother. I think that this is worse than an abortion where the child does not survive. We are reaping what we have sown, western society has for some time now been continually pushing back on morality, ethics and anything to do with God. We failed to speak up when we should have, mostly because we didn’t want to ‘offend’ and now we have a society that only believes in having ‘the right’ to do what they want when they want and with ‘whomever’ they want. 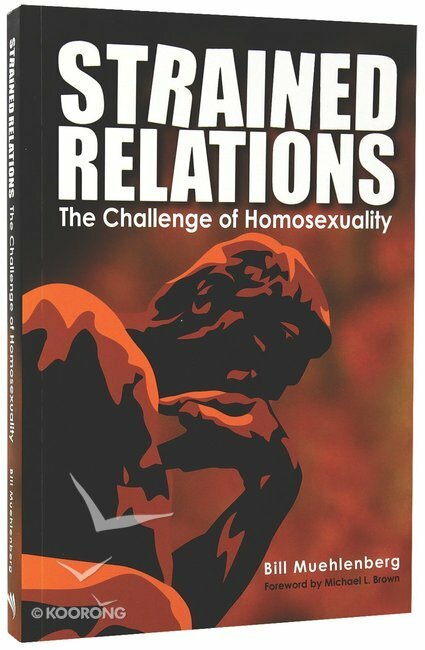 The churches have abdicated their role in providing a moral compass for the people, even worse, some churches approve and support the ‘new’ morality. I would not want to be one of those shepherds on the day of Judgement. God will not be mocked, they will reap what they sow, yet, we must pray that they may repent and know the truth. Yes Bill, those holding the signs do know what they’re doing, like the crowd screaming before the crucifixion, “His blood be on us, and on our children”. The picture of the woman dressed as a womb seems to hold a second crazy example (click on it for a larger version). The sign held by the person to the right of picture, is obscured by the red woman’s left “ovary”, but it looks something like “Abortion = Healthcare”. But this person is in a wheelchair, so could easily have been aborted as an “unviable fetus”. 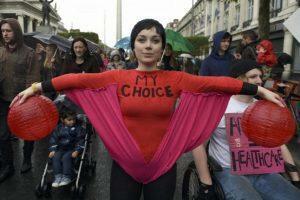 Body-control is the LAST thing pro-abortionists want. IF control is so important, why/howcome the pregnancy? To put it crudely: The Cow wants the Bull but Not the Calf. Most lies contain some truth; the more truth, the greater the danger. Ignorance of consequences isn’t ANY protection. The ‘right’ to refuse (an abortion) rarely seems to enter the equation.